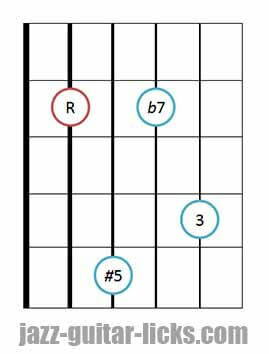 What's a dominant 7#5 chord ? 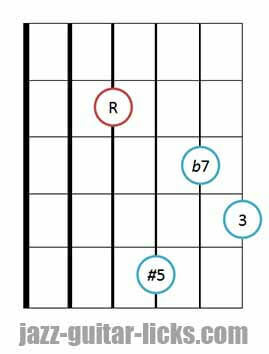 A dominant seventh sharp five chord is also known as "seventh augmented fifth chord" or "augmented seventh chord". As its name implies, it consists of a dominant seventh chord with an augmented fifth instead of a perfect fifth. It can also be viewed as an augmented triad with a minor seventh. 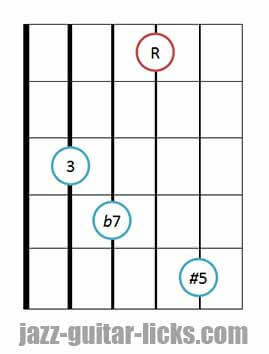 Chord tones are : root (1), major third (3), augmented fifth (#5) and minor seventh (b7). 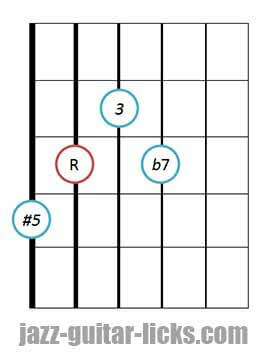 Dominant 7#5 chords produce a dissonant and unstable sound. They can be used to add tension in your playing. Seventh augmented fifth chords can be written +7, aug7, 7+5, 7#5. 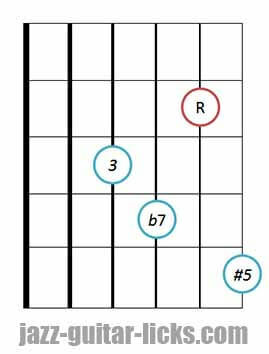 Here are the 7#5 drop 2 voicings related to the 12 guitar chord shapes below. 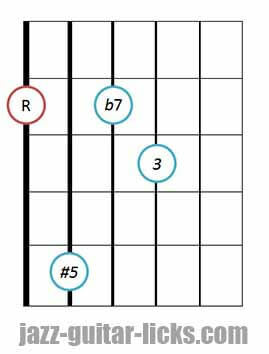 What are drop 2 chords ? 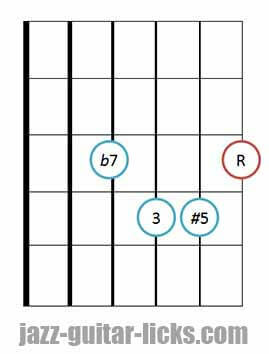 Drop 2 chords are surely the most used voicings by jazz guitarist (The term "voicings" refers to the order of notes in a chord). They are built by dropping the second highest note of a four-notes close chord to the bass. 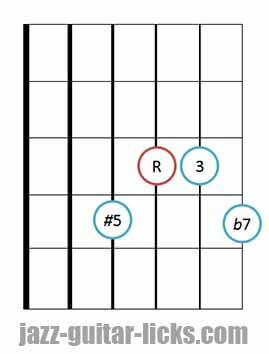 7#5 close chord formula is 1-3-#5-7 that gives the following drop 2 chord formula #5-1-3-7. 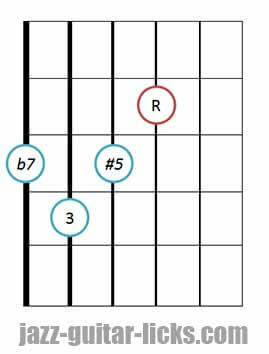 What is an inverted chord ? It means that the notes of a chord are inverted, there can be a third, a fifth or a seventh in the bass. 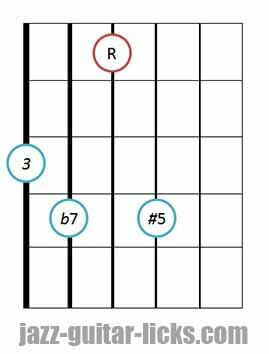 Root position - 7#5 chord - Root in the bass - Bass on E-string. 1st inversion - 7#5 chord - Third in the bass - Bass on E-string. 2nd inversion - 7#5 chord - augmented fifth in the bass - Bass on E-string​. 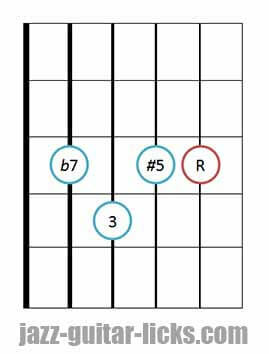 3rd inversion - 7#5 chord - minor seventh in the bass - Bass on E-string​. Root position - 7#5 chord - Root in the bass - Bass on A-string. 1st inversion - 7#5 chord - Third in the bass - Bass on A-string. 2nd inversion - 7#5 chord - augmented fifth in the bass - Bass on A-string​. 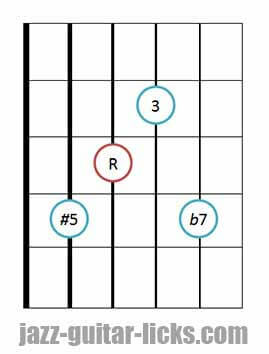 Root position - 7#5 chord - Root in the bass - Bass on D-string. 1st inversion - 7#5 chord - Third in the bass - Bass on D-string. 2nd inversion - 7#5 chord - augmented fifth in the bass - Bass on D-string​.